Halloween. Thanksgiving. Christmas. New Year’s. The holiday season brings so much trial and tumult, it’s hard to imagine ever getting through. But just as quickly as it comes, it goes. And all of a sudden, here we are in April… no foolin’. So as you sit and ponder the idea that the whole crazy cycle will begin again in only six short months, perhaps the best defense is to plan a fantastical respite in a faraway land. Like, for example, the Tween Waters Inn in lovely Captiva, Florida. Of course, as you look out your window at the remnants of a winter gone bone-chillingly wrong, we have to confess something about the subtropical paradise we locals call home. It’s not always so delightful outside in April. Oh sure, the average high temperature is 84 degrees, there are typically 10 hours of sunshine and the UV index usually hovers around 11 – but, according to the fine folks at Weather Atlas (www.weather-us.com), you can probably count on about four “rainfall days” during the month, too. And if your Gulf Coast escape happens to coincide with one of those days, it helps to have a Plan B that involves something beyond taking out a second mortgage to party with a cartoon rodent in Orlando. Thus, we present the happiest place on Earth… Southwest Florida style. After time spent at the Oasis pool or beachside watching feeding pelicans, scurrying sandpipers and frolicking dolphins, you can greet the intermittent dreary day with a trip to the Tween Waters Marina to rent a bicycle, stretch your legs and embark on a fairy tale journey – no pixie dust required. 1. Don’t fall down a rabbit hole… simply stop by The Mad Hatter Restaurant, at 6467 Sanibel Captiva Road, for a spectacular view. 2. Channel your inner Aladdin and search for Iago among the parrots and macaws creating a hubbub outside Jerry’s Foods. 3. Need a Frozen treat? We cannot tell a lie… the ice cream is simply delicious. Stop by Pinocchio’s and have them scoop you up a Dirty Sand Dollar or Sanibel Krunch – their two signature flavors. 4. Stop by the Captiva Memorial Library and grab a few books to read when you’re back to poolside and getting yourself lost in a myth, legend or fable. 5, Channel your inner Pongo and Perdita from 101 Dalmatians and slurp up some delicious pasta primavera at the Crow’s Nest Bar & Grille. 6. And lastly, drift off like Sleeping Beauty after a trip to The Spa at Tween Waters for a massage. Do all those things by the time you re-embark for parts chillier and less lush, and it’ll be a homebound happy ending… and, what’s more, it’ll surely have you ready for battle come next October. You’ve reached Southwest Florida’s premier resort. You’ve unpacked warm-weather gear from a wind-chilled suitcase. And you may have even run your toes through Captiva’s silky soft, Gulf-kissed sand. While a week spent charging poolside drinks and posting sunset selfies would surely make you the envy of family and friends back in Minnesota, Michigan or Mississauga, the humid, tropical air and rolling waves might simultaneously spark your interest in something a tad less sedentary, too. And what, I ask, could possibly sound less sedentary than kiteboarding? Of course, before you get started you’ve got to lay down some definition boundary lines. Though it’s frequently lumped in with other seaside endeavors like wakeboarding, surfing, paragliding and sailing – kiteboarding harnesses the power of the wind with a large, controllable kite that’s propelled across the water. It’s less expensive and more convenient than other alternatives and unique in that it harvests the wind energy from a much larger atmosphere volume. It’ll take a giant leap toward the mainstream when it’s included on the roster of events for the 2024 Summer Olympics in Paris, and likely in for an uptick on the 1.5 million worldwide participants. Many blogs and websites prominently list Southwest Florida among the country’s best kiteboarding sites, and a quick Google search returns several local businesses that provide rentals, lessons and additional information. Ideally, your journey should begin with a trainer kite, which allows you to get familiar with the all-important “wind window” while practicing turns. Pulling left on the kite’s power bar — about 2 1/2 feet long, functioning like a set of handlebars – moves the kite left and pulling right moves it right, with the most dramatic movements coming in the window’s center. Once you’re up and running with the real thing, you’re attached to the kite with a harness and connected to the board via foot bindings. Stand with your back to the wind and envision the horizon as the top half of a clock, making sure to always keep the kite between 9 a.m. and 3 p.m. The kite’s most powerful aerial position is 12 p.m. Pulling the bar closer or letting it move away also impacts power, with the midway position providing the most. If you panic or suddenly feel out of control, let go of the bar and the kite will lose power. Just getting comfortable with the feeling of being pulled by the wind is a hugely important step, as is the process of moving the bar from side to side to get a feel for the kite’s movement. Start by sitting in the water with the board and allow the kite to move into a power position. The pull of the kite will pull you up out of the water, and, while leaning back, presto… you’re kiteboarding. Get up every time you fall down. Make sure to get a good smartphone shot for the frigid folks up north. P.S. — When the shadow of your kite swoops along the water past your unsuspecting 10-year-old son, who, mistaking it for a shark, shrieks loud enough to wake a nearby sunbather… you’ve arrived. This just in… it’s a New Year. And as your official outdoor adventurer of 2019, I’m making it my duty to peel you away from the lemmings who’ve greeted the arrival of another January 1 with another cadre of ineffectual resolutions. You know the type. They vow to eliminate any trace of carbs from their diets and solemnly swear to spend every non-sleeping, non-working moment on the treadmills at the nearest Planet Fitness. But by Valentine’s Day, they’ll already be pining for atonement. Here at the Tween Waters Inn, though, we approach our resolutions a little differently. Toward that end, we’re taking the day’s buzzword – RESOLVE – and mapping out a 2019 agenda. Commit yourself to this plan, one letter at a time, and we promise a calendar-full of contented smiles. Licensed professionals and massage therapists create a magical day that will transport you to your bliss – individual or couple, in-spa or in-room, even the bride-to-be and her entourage. Delightful options include traditional, creative, even romantic massage therapies. Healthful, fragrant body treatments. Deep-cleaning and laugh-line-cleansing facials. Beautiful, pampering manicures and pedicures. Active enthusiasts find a lot to love about the resort, too. Pick up a tennis racket and volley away on private courts. Pedal a bike along the peaceful shore or breathtaking Captiva Drive, overlooking the Gulf of Mexico and a private beachfront. Step, jog and lift in the guest fitness center. Or walk the beach, peaceful sunup to majestic sundown. While the rooms at the resort are comfortable and cozy, most visitors come to ‘Tween Waters for the miles of pristine beaches on its Gulf of Mexico side. Captiva and its sister island, Sanibel, are known to have some of the best shelling beaches in the world. You’ll see many guests bent in the “Captiva Crouch,” searching for the perfect specimens for hours on end. Hungry? Thirsty? Wet? Then hop out of the pool and seat yourself to a tasty lunch at the Oasis Pool Bar. Here you’ll find just about everything under the sun (or under the umbrellas) – grilled sandwiches and fresh salads, ice-cold beers and fruity blends, even frozen treats for the kids. They’re all served with a splash of warm, friendly smiles at no extra charge. It’s a resort tradition that spans almost 25 years – so on your marks, get set and make sure you go to the hilarious, one-of-a-kind Captiva Crab Races at Crow’s Nest Beach Bar & Grille, hosted by the one and only Commissioner Tim. It’s a laugh riot you don’t want to miss – plus half of the proceeds are donated to United Way. With the Gulf of Mexico to the west and Pine Island Sound to the east, adventure is calling at The Marina at ‘Tween Waters. Resort guests enjoy deep sea or near shore fishing. Island hopping and stopping. Breathtaking sightseeing. Eco-adventures among mangrove keys and nature’s beauty. Even up-and-away adventures over the islands. With boat rentals, expert guides, a variety of water sports. Experience Captiva’s most outstanding dining – named No. 1 on TripAdvisor – for delicious fresh seafood and sushi. And as renovation and enhancement of the landmark Old Captiva House restaurant continues, guests are invited to enjoy the same taste in a new location at the Canoe & Kayak Club overlooking Roosevelt Channel on the resort’s eastern shores with seating indoors or outdoors. Have a great 2019 everyone! It’s not easy being 10. You can’t drive a car. You can’t stay up super late. Sheesh… if you’re in my family, your parents won’t even let you have a phone. But it’s not all bad either. For introduction’s sake, my name is Ryan. I’m about to start fifth grade and I love this place. 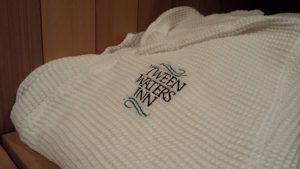 If you’ve never been to the ‘Tween Waters Inn during the best two months of the year – also known as the time when you’re not in school – you really need to go. The weather is tremendous, there’s water on both sides of the resort and there are a ton of cool things to do on the property, too. And there’s not a homework-starved teacher within 50 miles. Anyway, we arrived for a week’s stay in the Palmetto building, which enabled us to bring along our 12-year-old pup, Rusty. I was in charge of activities, so I made sure everyone packed gym clothes, pool clothes and tennis clothes, and bum-around clothes for anything else I decided to come up with. With me in charge, that meant a little bit of everything. I set the alarm clock in the room for 6:30 a.m. each day and made sure the folks were on the tennis courts – the resort has two – by 7. Mom and I teamed up to play against Dad for the first little while each day, before she took a water break and let me try to take the old guy down one on one while she worked the camera. We dropped swim gear on beach chairs as we walked from the courts past the pool and headed to the gym, where I mandated 30 minutes of work in a room full of treadmills, ellipticals and recumbent bikes. A jaunt back to our room for quick showers preceded a return to the pool, where Mom and I went back and forth between playing with dive toys and swimming laps while Dad relaxed and recharged – he played tennis two against one, after all – with multiple 15-minute turns in the hot tub and multiple smoothies and other frozen delights from Tween’s Beans Coffee Shop. By the way… if you go, tell them Ryan told you to ask for Kettia. Meanwhile, the more I swam, the more I pondered what else to put them through… or in this case, on. And being a water guy, to me that meant a kayak. So Dad and I headed down to the beach alongside the marina, where resort partners from Adventure Sea Kayak and SUP run guided tours each day at 9 a.m., 11:30 a.m., 2 p.m. and 4 p.m. We chose the late-morning trip and each grabbed a solo kayak to head out with super-chill Aleks – a soon-to-be senior at nearby FGCU who led the tour – along with four other people who paired up in two other kayaks. Aleks paddled us out on the resort’s east side, across Roosevelt Channel and through a mangrove-canopied water trail through Buck Key. He was in the midst of a discussion about the nearby water fowl – cormorants, ospreys and ibises, etc. – when Dad spotted a fin about 10 yards in front of my kayak. My first thought was “dolphin,” but when the fin zig-zagged at the surface toward me, Aleks corrected me. In fact, it turned out to be a pair of mid-sized bonnethead sharks, smallish members of the hammerhead family who max out at 4 1/2 feet, make their homes in coastal waters, bays and estuaries and feed mainly on crabs and other crustaceans. At that moment, though, based on my racing heart and sweating palms, it might as well have been a great white. Take a look at a quick video here. We managed to survive the shark encounter and later swung by a huge property adjacent to the resort, where the owner of the Doc Ford’s restaurant chain lives. A gated-off waterway alongside his property is home to a small family of manatees, and Aleks let us paddle right up to the No Trespassing sign as the majestic sea cows swam back and forth between our boats as we snapped pictures. I’m a hungry guy, so the thought of our family’s past trips to Doc Ford’s made me start thinking of food, and the many outstanding meals available right on property at the Crow’s Nest Bar and Grille. There was no way I was going to spend a week at the resort without testing out the Mac-n-Cheese Salsa Dip appetizer, which blends melted cheddar cheese with salsa, elbow macaroni and tortilla chips. Tell Jasmine that Ryan said hello, and she might just hook you up with an extra plateful of pasta primavera. The dish alone is worth a flight from Minnesota, Montana or Malaysia, but you really can’t leave the Crow’s Nest without experiencing the sheer goofiness of Sunburned Willie’s Crab Races. It’s hard to explain to someone who’s never seen it, but try to imagine a roomful of screaming adults and children cheering for hermit crabs as they crawl from the center to the outside of a circular table. Each child in the audience can name and bet on a crab for just $2, and the adults can pair up to back a crab for the same $2 entry fee. The field runs through two preliminary heats before a championship race, and the money is collected and paid out to the “owners” of the top five finishers. Family races are set to go at 6 p.m. on Mondays and Thursdays, with adults-only races the same nights at 9 p.m.
Take a look at a championship race video here. Trust me, by the time you’ve done the tennis courts, the gym, the pool, the kayaks, the restaurant and the crab races, you’re going to be pretty tired. But if your parents learn anything about Southwest Florida before they head down here, it’ll probably have something to do with our sunsets. Simply put, there’s not a place outside of Key West itself that does them any better. Conveniently enough, the Gulf of Mexico is just a few dozen steps from the front door of the Crow’s Nest. And when the family crab race wraps up around 8 p.m., it leaves just enough time to stroll across Captiva Drive and onto the sand for a prime view of the glowing orb descending into the horizon. The tandem cabana chairs are a great place to take a look, though some hearty souls head right down to the water’s edge as they try to use nature’s majesty to augment the perfect selfie. Just remember to keep an eye out for wannabe ballerinas pirouetting across the sand as you work the flash button. And remember to remind your friends at school that your summer was way cooler than theirs. But it’s got nothing to do with Santa, Rudolph or stuffed stockings. Rather, for those lucky enough to spend time in Southwest Florida, it’s an annual sun-drenched celebration known as the summer solstice. The Old Farmer’s Almanac defines the solstice as the mid-June instant in the Northern Hemisphere when the sun reaches its highest and northernmost points, conveniently making the calendar day on which it occurs the one with the most sunlight time out of all 365 days in a given year. Here in Captiva on June 21, that meant a cool 13 hours, 48 minutes and 21 seconds. And for your favorite Tween Waters Inn adventurer, it meant a corresponding agenda stretching from 6:36 a.m. clear through to 8:24 p.m.
Of course, given the complement of activities available via the resort and its island partners, the prospect of finding enough solstice things to do was far less daunting than the specter of finding the energy necessary to actually do them all from early in the morning to the middle of the evening. Oh well, it’s a sweaty job… but someone’s got to do it. Seizing the island’s pre-dawn serenity, I began the gauntlet with a stand-up paddleboard jaunt across the gulf – which simultaneously allowed unique perspective to a Thursday sunrise and discovery that while they’re not quite kayaks, the water-skimming crafts are bigger than surfboards and remain stable enough to stay afloat under the haphazard captaincy of a bleary-eyed New York-born 49-year-old. Kneeling and paddling were a relative cinch, and, though my wobbly transition to standing won’t earn me a spot on anyone’s SUP fantasy team, the idea that I did so without becoming a shark’s breakfast was a huge moral victory. So long as you keep your feet spaced and your weight distributed, the rest, for a newbie, is pretty much academic. Simply put, staying steady equals staying dry. Upon successfully surviving the gulf, the scene shifted to the resort’s east side where paddle gave way to oar for a two-hour mangrove kayak tour led by Adventure Sea Kayak and SUP. The trek takes participants across Roosevelt Channel and onto a water trail cutting through Buck Key, and it provides a chance to interact with manatees, dolphins, herons, egrets, anhinga, cormorants, ospreys and otters. Trying to get a perfect shot of a majestically surfacing manatee is practically impossible for a middle-aged guy wedged into a kayak and armed with only an obsolete cell phone to document the interaction, and the graceful sea cows seem to know exactly when to appear while you’re still fumbling through your access code, and precisely when to submerge just as you’ve lined up the perfect shot. It was frustrating enough to make a guy crave seafood. And fortunately, the Oasis Pool Bar was there to indulge. It only took a few dozen steps to get from beached kayak to pool-side table, where a perfectly charbroiled gulf grouper sandwich ($14) provided a taste of revenge and a nicely chilled three-rum punch ($12.50) dulled the burgeoning soreness erupting from kayak and paddleboard taxed joints. A relaxing mid-afternoon bike ride seemed the perfect follow-up to a casual midday lunch, and the quest for mild exertion amid world-class visuals began at the marina, where a full complement of non-geared bikes is available for rental by resort guests. Rates start at $15 for the first two-and-a-half hours and $5 per hour thereafter, an outlay which provides instant access to a fleet of ready-to-roll machines. A leisurely pedal took me past fishermen on the Blind Pass bridge, alongside white egrets strolling the fence line at the “Ding” Darling Wildlife Refuge and face to face with a gopher tortoise happily munching grass while cars whizzed past just feet away. The refuge’s parking lot was a pit stop prior to a tail-winded return trip and the jaunt was capped by a visit to the beach across Captiva Drive from the resort. It had already been everything a sun-worshipping blog jockey could want. But after paddleboards, kayaks and bicycles… something was still conspicuous by its absence. Feeling the need for a buried speedometer, I headed straight down Captiva Drive, took a quick left onto Andy Rosse Drive and sidled up to the desk at YOLO Watersports, where a fleet of WaveRunners — Yamaha’s proprietary label for the crotch rockets capable of up to 50 mph alongside dolphins, tarpon and whatever else that may sidle up — is available for rental in 30- and 60-minute increments. Rentals run from $90 for the half-hour to $120 for a full (per machine, not per person) and as many as three people can pile on, provided the combined weight doesn’t exceed 450 pounds and the driver is at least 16. The ride area spans a mile-and-a-half along the coast and up to two miles offshore, and that’s aside from guided tours which take riders up to and around Cayo Costa before returning to home turf. Still, I prefer to think of it not as slow, but deliberate. Anyway, the sound and feel of sea breezes reignited the collective appetite and sent our little crew – now augmented by the aforementioned son and my perpetually patient wife – back to our favorite resort dinner haunt, The Crow’s Nest Bar and Grille. We dug into a pair of garden burgers and a serving of pasta primavera and dropped a couple bucks on the Captiva Crab Races while intermittently glancing out the window to make sure we’d not miss the marathon day’s final act, a sunset stroll on the beach with our resort newbie Dalmatian, Elsa. The sluggishness of our crustacean ensured an on-time departure, and we kicked off our sandals at 8:19 p.m. – precisely five minutes before the glowing orb disappeared and began the stretch of 183 progressively sun-shortened days until winter formally arrives in the form of a 10-hour, 28-minute, 33-second solstice encore on Dec. 21. It’s a little sad to realize it’ll be six months until days start lengthening again. So long as the paddleboard doesn’t require chains and snow tires, though… I think I’ll manage. The Banzai Pipeline at Oahu. The massive swells off the coast near San Francisco. The sandy point breaks along Puerto Escondido in southern Mexico. They’re among the world’s premier spots for surf enthusiasts. But in case you hadn’t noticed, the island of Captiva isn’t included. Compared to the jetties, piers, coves, points and turbulent ocean storms combining to create water-logged Valhallas for modern-day Beach Boys aficionados, the sands in the vicinity of the Tween Waters Inn are typically much mellower and free of topographical wave catalysts. In fact, waves over a recent five-day stretch rarely exceeded “flat” or “1-2 foot” status, according to www.SwellInfo.com, and even when they did it was only to a waist-high 2-3 feet until winds settled back into their typical 5-10 miles per hour range. Still, for those looking to indulge an inner Laird Hamilton on a smaller scale, there are options. For those uninitiated, it’s a sport in which a “skimboard” – similar to a surfboard but smaller and without fins – glides across the water to meet an incoming wave and ride it back to shore. It originated in Southern California, when Laguna Beach lifeguards wanted to surf local shore breaks that were too fast and shallow for surfboards. And all that’s necessary for the TWI version, too, is a board and a beach. That’s where the resort’s partners at Yolo Watersports – just moments away at 11534 Andy Rosse Lane – come in. Yolo offers rental boards in a variety of sizes, accommodating up to 175 pounds, but the general rule is that the ideal skimboard roughly stretches up to mid-chest height on its rider. Rates are $12 for the first 24 hours and $5 for each subsequent day. Larger boards are faster but will not maneuver as rapidly. Meanwhile, smaller boards tend to be more agile but slower. Thickness plays a crucial role, too, because thicker boards will glide better but won’t turn as well because they lack responsiveness. Of course, if you’re as new to the activity as I was… it won’t matter. You will fall down. A lot. Why? Because just like riding a bicycle, learning how to balance on a skimboard is best done while the board is in motion, not standing still, which means each tumble gets you a step closer to mastery. And unlike riding a bicycle, clumsily falling onto sopping wet sand is far more amenable to the head, knees and backside than plummeting onto a concrete sidewalk or a pockmarked roadway. The basics from there are, well… pretty basic… depending on the experience you seek. The best setting for skimming across sand is a flat beach, while beaches with more pronounced slopes are better for wave skimming. Also vital to the endeavor is a dedicated pre-skim stretching session to avoid the embarrassment of pulled muscles along with the requisite bumps and bruises. A bit of 49-year-old advice, friends… don’t sleep on the pre-skim stretching. Anyway, practice by leaning over and lowering the board six inches from the ground. From there, push the board across moistened sand – parallel to the shoreline – and rise up as you chase it and ultimately run onto its surface one foot at a time, subsequently bending your knees to complete the slide. The more you try the move, the better you’ll get (trust me! ), until you can do it in one step with full alacrity. Or at least something resembling alacrity. Let’s call it a step past sluggishness. Upon mastering the sand skim, turn your sights to the water and run through the same basic steps, making sure to choose a wave that you can get to and then skim without compromising balance. Shift your weight to the inside or outside of the board depending on which direction you intend to turn, and once you skim up the wave’s front, turn away from it and ride it confidently back to the shore. When you arrive, accept the affections of your adoring crowd. I had all the posters on my wall. The lemon-yellow Indy 500 racer coolly piloted by Rick Mears. The tri-colored Pontiac that helped Richard Petty annually rule Daytona. The black-and-gold Trans Am every pre-teen boy was sure would make him as cool as Burt Reynolds in Smokey and the Bandit. Even the navy blue Harley-Davidson Softail my brother raced around the streets of our hometown. OK, that last one was more a snapshot than a poster. And I concede to still-lingering trauma from a harrowing 100 mph stint as a passenger after ol’ Mitch snatched me from college for an impromptu 21st birthday weekend in Niagara Falls. Some years have surely passed since No. 21, but the vibe for cool means of transport remains. Especially when it comes to cool places. So when it came to a recent return to Captiva, the mandate was clear. That meant another 20-minute stroll from the Tween Waters Inn to Yolo Watersports on Andy Rosse Lane, where there’s been a new addition to a burgeoning roster of ways to experience the island. This one’s called the “Scoot Coupe,” which translates to a three-wheeled, open-air scooter car powered by a 49 cubic-centimeter gasoline engine. Said engine carries the two-seater at a super-efficient 80 miles per gallon and allows it to top out at an impressive 35 miles per hour. It’s the perfect ride for an afternoon in Captiva’s “downtown” area, which for a brave passenger – my 10-year-old son, Ryan – and I meant a spin from lunchtime quesadillas at RC Otter’s to book perusing on the shelves at Captiva Memorial Library to vanilla bean Frappuccinos at Starbucks down Captiva Drive. The geared-down speed limit on the island’s north end prevented us from burying the speedometer needle in the red, but the sun on our backs and the breeze past our heads were no less exhilarating as we wrapped up our voyage with a visit to the sandy shores at Alison Hagerup Beach Park. The promise that the coupe would be sleek, elegant, practical and fun was nothing if not spot-on, and the experience as a whole provided the exact same kick-start for Ryan’s wannabe driving fantasies as the aforementioned Chaparral, Grand Prix and others did for his old man way back when. If you plan to give it a try, remember it’s a two-seat vehicle and is made for only two passengers – meaning not two adults and a baby and not two adults and a dog, only two heartbeats per machine. Renters and drivers must be at least 18 years old (sorry, Ry…), passengers must be at least 6 and the maximum combined payload (passengers and gear) cannot exceed 415 pounds. A valid driver’s license and credit card are required as well, and prices range from $129 for a four-hour rental to $179 for an eight-hour stretch. A 24-hour rental goes for $199 and an additional day can be tacked on for $89. More information is available at 239-472-9656, 239-472-1296, 239-472-1162 or via info@yolowatersports.com. I’ll certainly be back for a return trip before too long. And who knows, maybe I’ll even give Mitch a ride to the next birthday bash. If you ask me, Michael J. Fox is the culprit. After all, it was a movie in which he played a starring role — 1989’s “Back to the Future Part II” — that first made red-blooded American boys like me start dreaming about the airborne sweet spot somewhere between terra firma and a jet airliner at 30,000 feet. OK, full disclosure… I was 20 going on 21 when the movie came out. Fox is Canadian, though, so there’s got to be a favorable conversion rate in there somewhere. Anyway, the point is that after watching Marty McFly bounce off walls and race next to cars with what amounted to a low-hovering skateboard, we all figured similar real-world gallivanting was imminent. But now, as 49 stares down the barrel at 50… Fox’s fantasy still seems way too far-fetched. At least when it comes to land, that is. Fortunately, the ‘Tween Waters Inn is flanked on two sides by water, which provides a bit more opportunity for those still hoping to give ol’ Michael J. a run for his multi-colored money. And just as fortunately, it’s only a shade more than a mile from Yolo Watersports, too. There, at 11534 Andy Rosse Lane, TWI guests and visitors can get their Fox on in the form of “flyboarding” — an activity in which riders stand on a board connected by a long hose to a watercraft. Motion is created when water is forced under pressure to a pair of boots with jet nozzles underneath, providing thrust for the rider to fly as high as 50 feet in the air or dive headlong down to 8 feet. It’s $95 for a 30-minute session with the certified folks at Yolo, who’ll ride shotgun to ensure fun and safety while the paying customers – with pre-flight instructions rattling around in their heads – desperately attempt to replicate YouTube videos that make it look barely harder than riding a bicycle. For the record, those instructions seem pretty simple and focus mainly on basic movements – 1) stand with locked legs to begin; 2) point toes down or up to move forward or backward; and 3) lift alternating knees to go in the opposite direction (left knee moves you right, right knee moves you left) — but they provide little solace as you rise and tumble with all the alacrity of a sleep-deprived toddler. It’ll take all but full-on Olympians (read: show-offs) multiple tries (read: crashes) to stay consistently dry and vertical, at which point a true adventurer may endeavor to raise his or her game, literally, by raising elevation – which provides both the thrill of flying and the terror of crashing for the same low price. Soreness was alongside exaltation and exhaustion by the time my half-hour was up, though the sensation of a nose full of water lasted long after I’d gotten back to shore. Turns out a comfy chair and attentive servers at the Oasis Pool Bar quickly take the edge off, especially upon their arrival with a frosty Rum Runner or Margarita. And, whaddya know (eh! ), it only took two or three repetitions before I’d begun to forgive my Alberta-born nemesis. But I’m surely willing to negotiate. The Weather Channel was in ghastly form. Three-quarters of the country below freezing. More than 40 percent experiencing wintry precipitation. Snow angels, Southwest Florida style. And measurable amounts of the white stuff falling in North Florida from Tallahassee to Gainesville. It doesn’t snow in Southwest Florida. So while friends at nearly all points in the contiguous U.S. preoccupied themselves with the travels of “Winter Storm Grayson,” I grabbed my outdoor adventurer’s cap, scooped up the wife and son and again set out for the high Lee County seas. That meant a return trip to The Marina at ‘Tween Waters Inn, where we booked ourselves three seats on an afternoon beach/shelling excursion to Cayo Costa — a north/south barrier island about eight miles from the resort via Pine Island Sound. Another day in winter paradise. The boat docked on the island’s southeast side after a 30-minute ride, and a brief trip across a boardwalk and a tree-lined sandy path ended at the entry to a pristine white-sand beach that stretches the length of the island along the Gulf of Mexico. And even on a blustery 55-degree day, it was a shelling Shangri-la. The three-hour trip allowed for two hours of beach time, and the remoteness of the island — it’s accessible only by boat or helicopter — provided untrammeled shoreline and tidal pool examination simply not available in places with more traffic. Frenetic 9-year-old Ryan crammed a pair of one-gallon bags full of conchs, murexes and pretty much anything not nailed down, while the more discerning (age withheld) Danielle — with a single bag in tow — sought a very particular treasure consisting of olive shells, snail shells and fully intact sand dollars. The biggest lightning whelk on Cayo Costa, alongside a regulation-sized quarter. We were in full-on competition with a few fellow passengers for a couple hundred yards, before the field flaked off to just the heartiest hunters once we’d been walking for 45 or so minutes. Of course, armed with the Tennessee determination (read: stubbornness) of her mother Sondra, Danielle was hell-bent to go 20 yards past the longest survivor, and her indomitable nature was rewarded in the form of a barnacled lightning whelk as big as my head that weighed in at a cool seven pounds. Her semi-educated guess was that it had been in the water for half a century, which paired nicely with the Nike swoosh-shaped piece of sea glass she figured had been wet for roughly a decade. We lugged our haul to the boat to claim prime return seats, a choice that paid off with a clear view of a frolicking bottlenose dolphin herd about 50 yards off the bow. Any shot at glimpsing manatees, however, was short-circuited by the cold snap that drove the regal sea cows to the warmth of a nearby power plant. Sand dollars, shells and other treasures. Absent our mammalian pals, Ryan, Danielle and I rode out the final few miles spotting islands, flamingos, and buoys for blue crab traps — while simultaneously making advance choices for our dinner at the Crow’s Nest Beach Bar & Grille and thinking up mocking Facebook posts for our freezing-cold friends up north. Incidentally, Danielle and Ryan shared a Crow’s Nest Burger and an Ultimate BLTAE and posted half a dozen shots of the TWI sunset … while I had the grouper sandwich, then made up a catty meme for a friend in Niagara Falls whose pipes froze over the night before. My first concert was Van Halen. My first poster was Bruce Springsteen. My first girlfriend would have ditched me for Jon Bon Jovi. So, needless to say, music has played a role in my life for many years. And it’s no stretch to suggest – alongside champion boxer and prolific author – that being the front man of a rock band has been a prime fantasy of mine since the hair was long and the face was smooth. But a funny thing happened on the way to the Grammys… turns out I can’t sing a lick. Oh, I can hang with “The Boss” from the comfort of my bathroom and I’ve been known to draw stares as I belt out “Margaritaville” at red lights, but when it comes to hitting the high notes more than an arm’s length from showerhead or steering wheel, I’m far better off staying on mute. Given my role as TWI’s adventurer-in-chief, though, the right to remain silent is no longer an option. So with that responsibility weighing heavy on a recent Wednesday night, I paid a visit to the 8:30 p.m. karaoke session at the Crow’s Nest Beach Bar & Grille with an intent to indulge my inner entertainer. It’s a relatively new outlet for wannabes – having started as a regular weekly gig in early 2016 – but it’s an automatic attention-getter once the “stage” starts going up in the corner of the dining room. The stage is a stage by only the most liberal definition, of course, but once the predictable procession of Buffetts, Beatles and Beastie Boys begins revving-up the enthusiastic, bottle-tipping vacation crowd, it might just as well be the big room at Madison Square Garden. But if you think that might help with the nerves… think again. More than a dozen people were there to perform and I got the number nine slot, nestled comfortably between a retired U.S. Army master sergeant (we all know what divas they are) and a guy who did the worst Ricky Martin impersonation this side of the actual Ricky Martin. Whoa. The crowd was an eclectic mix of perhaps 30 people, ranging in age from early 20s to early 50s, most if not all dragged by a friend or loved one who was going to take the stage. I brought my better half and, having heard my act for 12 years, she compassionately began praying for a power outage. From the mic you could look out and see traffic drive by, which provided the comfort of knowing the world didn’t care. But that was all the relief I got as I learned other wannabe stars, too, tend to cut their teeth on the “Wanted: Dead or Alive” and “Cheeseburger in Paradise” ditties that I had planned. Suddenly, teen nights spent with headphones while cool kids partied elsewhere were a boon. Anyway, the sound of my thudding heartbeat essentially drowned out performers two through eight, and by the time my name was called an hour or so later, position nine turned out to be completely innocuous. People had lost steam after the first several songs and were busy refreshing their drinks by the time I grabbed the microphone – and within 10 minutes, my one-man show was over. I ducked into the bathroom and came back prepped for an encore, but by that time the Ricky Martin guy had hit the second verse of “Livin’ La Vida Loca” and I was already old news. So I headed to my Kia instead, and left the windows down while Bruce and I gave the residents along Captiva Drive an impromptu show for the ride home.